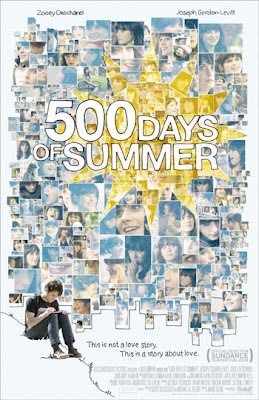 Just so you know, 500 Days of Summer is not about 500 days of sunshine; rather, 'Summer' is a girl. So I guess that makes you think it's a romantic comedy then. That's definitely wrong. 500 Days of Summer is the first great anti-romatic comedy. You self-confessed rom-com fans will love this if you loved He's Just Not That Into You. Take the storyline of He's Just Not that Into You, change it to 'she's just not that into him' and take out the 180 degree backflip at the end and you have 500 Days of Summer. Tom (Joseph Gordon-Levitt) is a bored greeting card writer whose life is truned upside down when he meets Summer (Zooey Deschanel). They begin to go out, but Summer doesn't believe in love. This is a problem for Tom, because he has believed in love ever since he watched The Graduate. So, they break up. Tom can't let go of Summer, so he looks back on their relationship to see what went wrong. And try to get his girl back. Part of what makes this film so great is the undeniable chemistry between Joseph Gordon-Levitt and Zooey Deschanel. You may recognize Gordon-Levitt from TV's 3rd Rock from the Sun and 90's comedy 10 Things I Hate About You. He's grown up since those days, and is shaping up to be one of this decade's best actors thanks to this film. The same goes for Zooey Deschanel. She's been in many films to date, like Yes Man and Bridge to Terabithia, but has never fully been in a good leading role. With this, she gets even more lovable. 500 Days of Summer screams 'original', with a very funny and different script. It's totally believable, and you're constantly drawn into the character's world. Adding to a perfect script is the perfect soundtrack. This gives a retro feel to the movie, which is complemented by Summer's awesome style. Director Marc Webb has delivered a movie most directors would love to have in their filmography. He has just been named as the director of Spiderman 4, which will be a substantial change of pace. All in all, 500 Days of Summer is definitely up there in my list of top films of 2009. And also one of my favourite films of all-time. That's saying something. Thanks to this film I have a new love for retro music; Joseph Gordon-Levitt is my new favourite actor and I can't wait to see him in Inception with my other favourite actors Leonardo DiCaprio and Marion Cotillard; and most of all, I have restored faith in the greatness of the independent comedies coming straight from Sundance. If you go into this film expecting a love story you will probably come away disappointed. However, I know it's impossible not to like this film. This is not a love story. It's a story about love.